Rotary Shaking Machines are used for shaking solution in Erlen Meyer Flasks. As it is an important laboratory testing equipment, we manufacture and supply some of the best machines in the market. 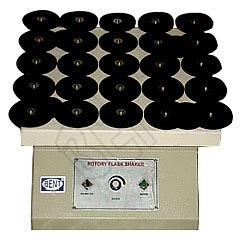 The Rotary Shaking Machine supplied by us is known for its excellent functioning and durability. The Rotary Shaking Machine consists of a platform which is attached with rubber discs to grasp flasks having capacity of 50ml to 1000ml. It has platform that is mounted on ball bearing crankshafts thereby offering an orbital circular motion to flasks. Herein, the entire assembly is mounted on a high quality metal casing that houses a motor coupled through V belt having pitch pulley. Speed regulator knob allows variability in shaking strokes.